Vitamin E works as an antioxidant, protecting the hair from dryness and making it look shiny! Not only that; Vitamin E rich foods repairs the hair follicles and promotes hair growth too. It deeply conditions the hair from the root and prevents hair-fall. It makes your hair strong and smooth, and tackles split-ends too! What more can you wish for? 9 reasons why Vitamin E is good for your hair? Apart from consuming foods rich in Vitamin E, you can also apply Vitamin E oil on your scalp and massage, to increase blood circulation, reduce inflammation and nourish the hair follicles. You need to do this on a regular basis to see good results. The major food sources of Vitamin E include spinach, kale, wheat germ, broccoli, olives, peanuts, almonds, sunflower seeds, etc. These can be had as such or cooked in a variety of ways, to make it more interesting and fun to include the vitamin in your diet! 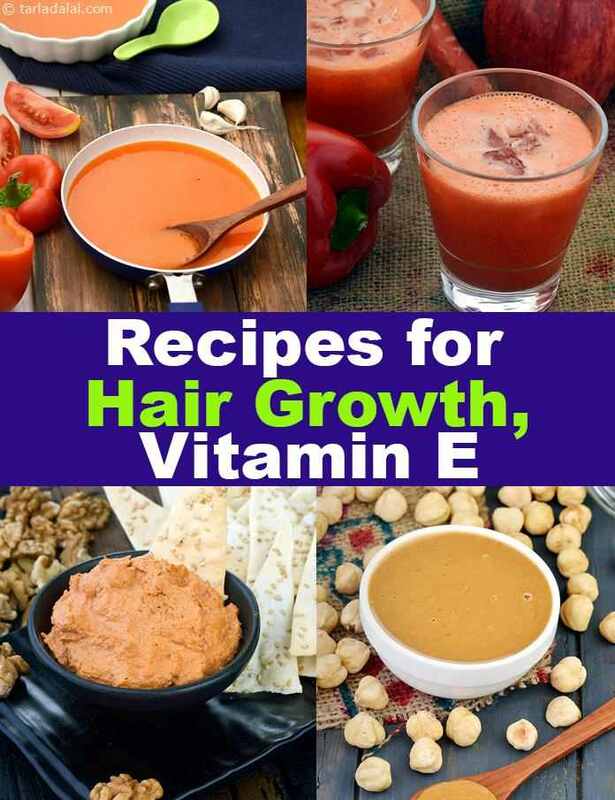 Here, we provide you with a selection of our favourite Vitamin E rich recipes for hair growth, which will have a positive effect on your skin and hair health. You can also supplement the Vitamin E rich diet with topical application of Vitamin E oils, under the advice and supervision of your doctor. If you like the Vitamin E Rich Recipes for Hair Growth article, then you will like the other articles of Vitamin E.